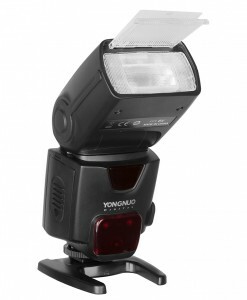 Yongnui RF-603N II is improved version of RF-603 flash trigger. It is a remote shutter release as well as a multi-functional flash trigger which can synchronously trigger flashes and studio strobes. This is the transceiver based system so each transceiver can be used flexibly as trigger or receiver. If you place it on camera, it will act as transmitter. If you mount it on flash speedlite, it will act as receiver. The 2.4 GHz wireless frequency is allowed in most countries and guarantees high speed, range and stability. Within capacious areas, the remote control distance may reach up to 100m. The synchronization speed can reach up to 1/320, depending on the situation. 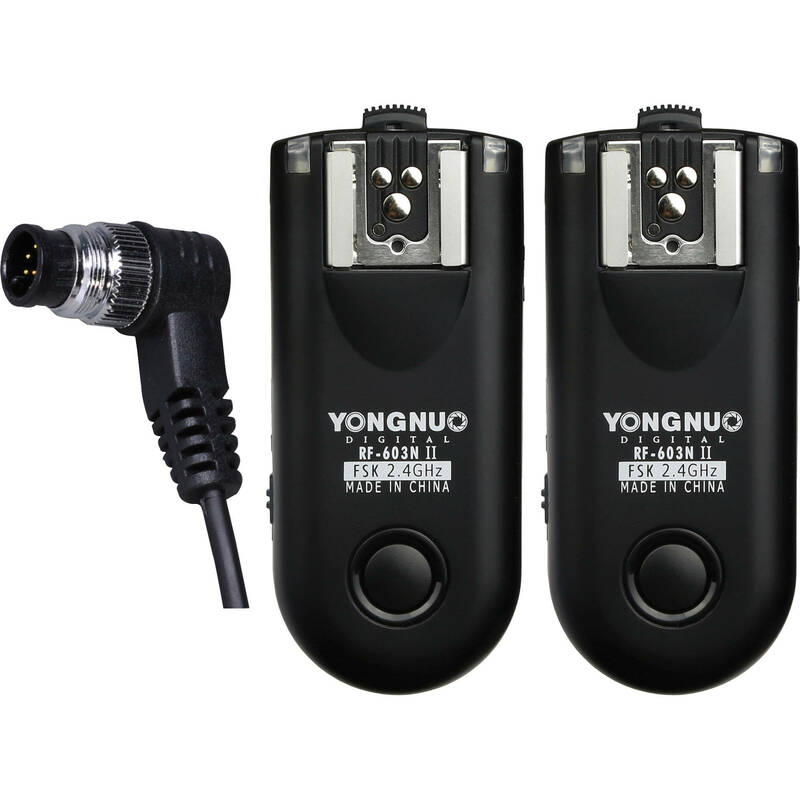 Yongnuo RF-603N II are long awaited updated version of RF-603 manual flash triggers. 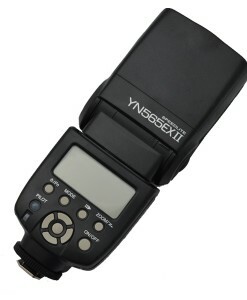 The RF-603N II are the follow up to the original and very popular inexpensive RF-603 flash triggers. And the MK II finally rectify many of the basic shortcomings of the original RF603 and RF-602 triggers. The RF-603 II now look to finally rectify most of those issues, providing what should be a very capable and convenient trigger now at the low price point. If you’re after a transmitter unit for the popular Yongnuo YN560 III, YN560 IV or YN660 manual flashes (which has an RF-603 receiver built in), the RF-603N II will definitely be the best option for now, if you are not interested in a little bit more expensive Yongnuo YN560-TX commander. 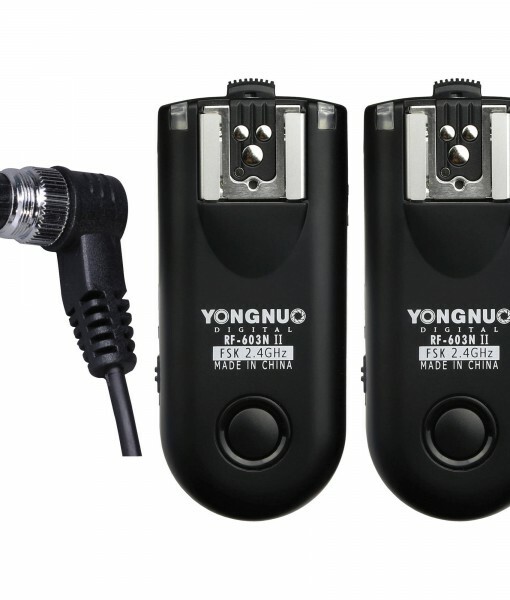 This RF-603N II Remote Flash Trigger Kit from Yongnuo features two 16 channel, 2.4 GHz transceivers as well as a shutter release cable for remote triggering of Canon cameras. Each transceiver has a male camera shoe on the bottom as well as a female hot shoe on top for triggering a flash unit. The system has a wireless range of 100m and can sync at speeds up to 1/320 second. 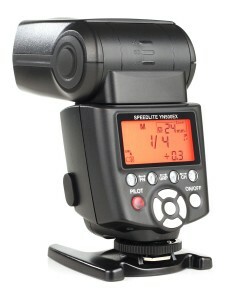 Additionally, it has a dual-function shutter release with half-press and full-press capabilities. The transceivers can be placed in either single transmit or transceiver modes depending on your needs and can wake up flash units and cameras. Also, it has 2.5mm and PC sync ports for using additional cables in order to connect studio flashes or to different cameras. This kit comes with a shutter release cable. Also, each trigger runs on 2 AAA batteries. When used as wireless triggering receiver, using shutter release or other extended functions, set to “TRX”. set to OFF to turn off the power. RF-603N 2nd version is fully compatible with 1st version – You can combine those 2 triggers with no problems. 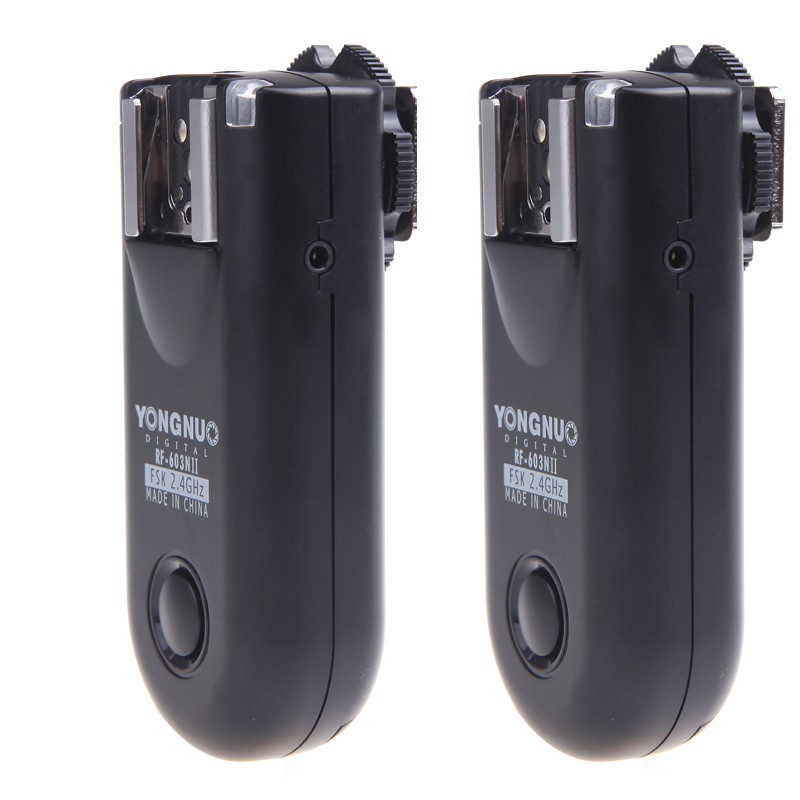 Flash Trigger: a) To fire the Flash Speedlite – one receiver can fire one flash speedlite. If you have only camera and 1 flash, you need 2 triggers. Put first in hot-shoe of the camera, second attach to flash speedlite and you are ready to go. If you have camera and 2 flashes, you need 3 triggers etc. 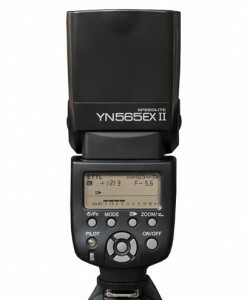 The exceptions are Yongnuo YN560 III, YN560 IV and YN660 flashes which have built in RF-603 received so for those flashes you do not need separate triggers. You only need 1 to attach it to Camera so it can send wireless signal to flashes. b) To fire the Studio Strobe light — You need to purchase an extra 6.35mm cable. Please check our LS-PC635 cable. You can use above two functions simultaneously, meaning you can fire both flash speedlite and studio strobe at the same time. 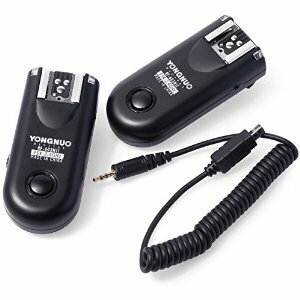 Note: This product can achieve wired / wireless remote shutter release function but needs LS-2.5 series shutter connecting cable according to the different cameras. When using the shutter release, the power switch needs to be set to ”TRX” state. 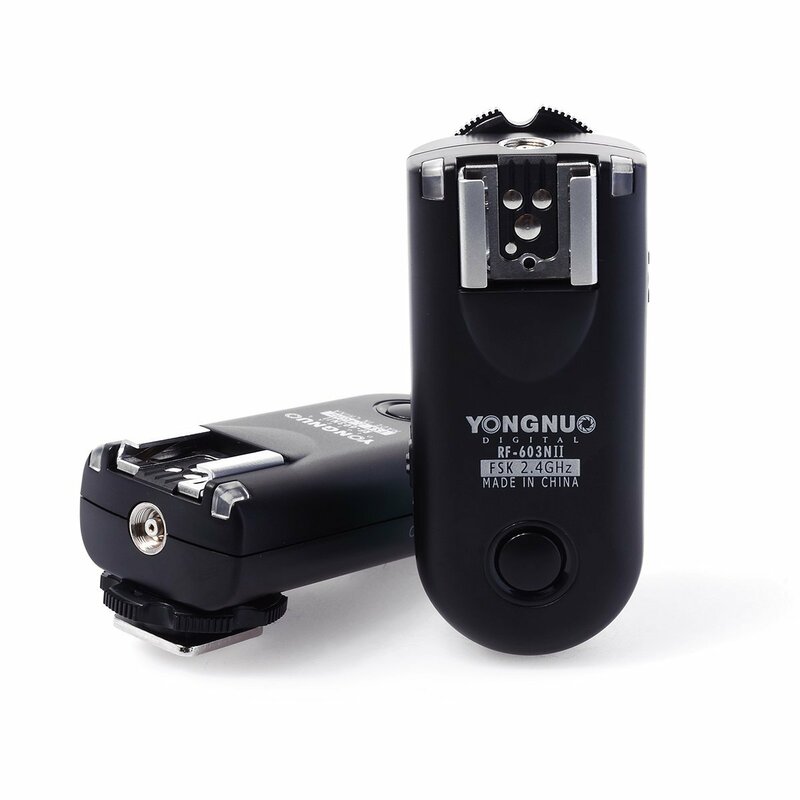 Yongnuo RF-603N II comes in 2 versions. Different versions have different shutter release cable so you can choose the related cable to fit your camera. Great triggers. I use them to trigger studio strobes so i do not need ttl. Work perfectly.